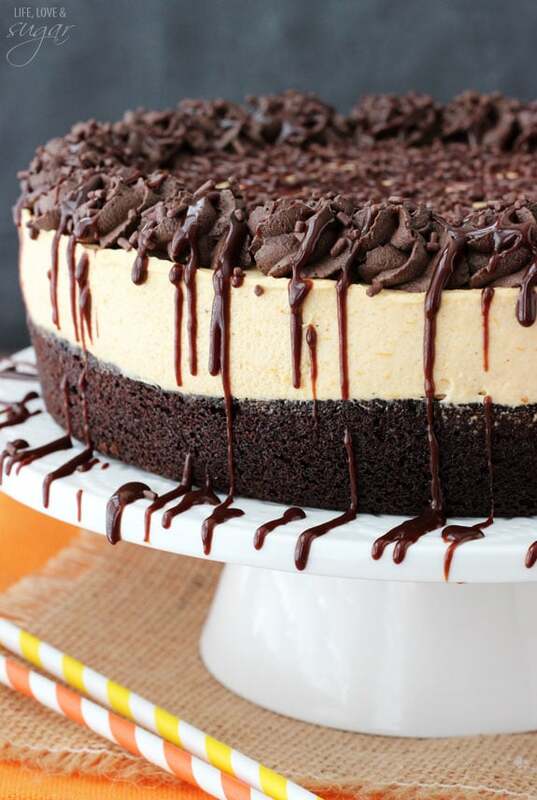 This Pumpkin Chocolate Brownie Cheesecake is perfect for fall and the holidays. If you haven’t noticed, I’ve been kind of obsessed with the pumpkin and chocolate combination. It’s just so good! This time I’ve got a delicious, moist brownie on the bottom and a no bake pumpkin cheesecake on top. It’s smooth, creamy, chewy and irresistible! So sometimes you have those moments where you are reminded to appreciate the little things. I had a cute little moment like that yesterday while flying home from Iowa. The guy next to me on my first leg of the flight sat down and told me it was his first time flying. He was about my age and so sweet. He seemed pretty excited to what it was like, commenting about everything. Once the flight took off, he said it was the coolest thing he’s ever experienced. He kept looking out the window and checking things out, noting that it looked just like google earth. He was loving seeing pools in people’s backyards and figuring out what different buildings were. When we landed he’d pretty much decided that flying was awesome and he couldn’t wait to make his connection and do it again. I’ve gotten so used to flying, I not only take for granted sometimes the convenience of it, but also what an amazing experience it really is. I mean, we fly through the air in a huge machine. What an awesome feat, right? It just reminds me to try and appreciate the things that I take for granted – even if I find them annoying at times. On another note, I’m in love with this cheesecake. 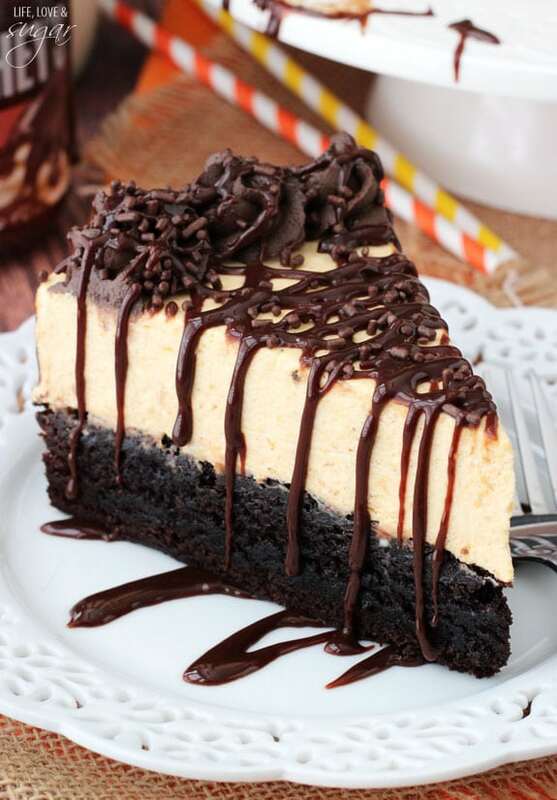 It is such a tasty mix of textures with the moist and chewy brownie topped with a smooth and creamy cheesecake. 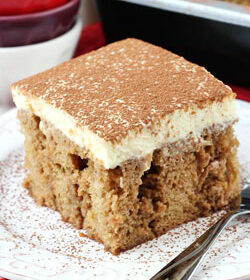 One of the things I love about this dessert is how easy it is to make. To start, I used a boxed brownie mix, but you could easily replace that with your favorite brownie. Once the brownie is baked and cooled, it will go into a 9 inch springform pan for adding the cheesecake. Because of that you’ll want to either bake the brownie in that same springform pan, or in another 9 inch cake pan that will fit nicely into the springform pan. 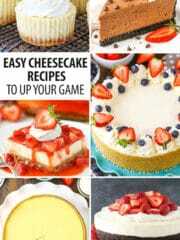 The layer of cheesecake is no bake and also quite easy to put together. 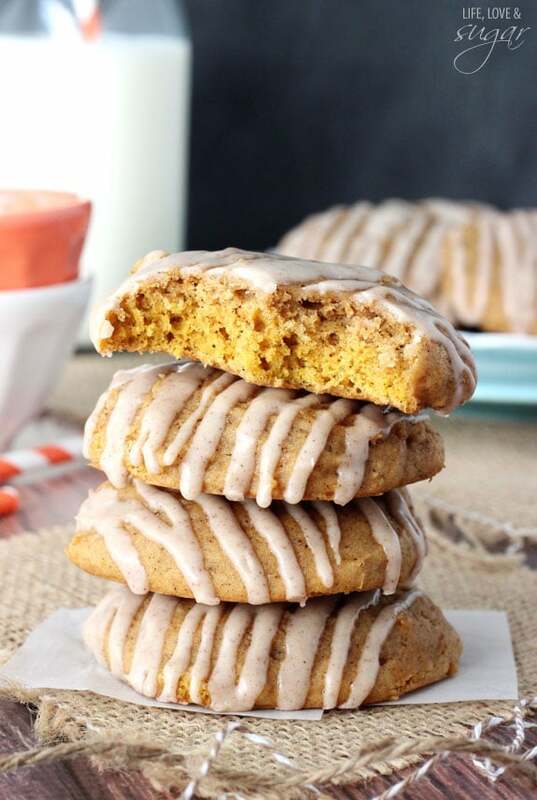 With the combination of pumpkin puree and pumpkin spice, it’s got the perfect pumpkin flavor. I like to wrap parchment paper around the inside edges of the pan before adding the cheesecake. That way, when I remove the springform sides, I can peel off the parchment paper and have beautiful, smooth edges. The cheesecake gets nice and firm once refrigerated. I topped the cheesecake with some hot fudge sauce and chocolate whipped cream, for little extra chocolate because, well, yum. 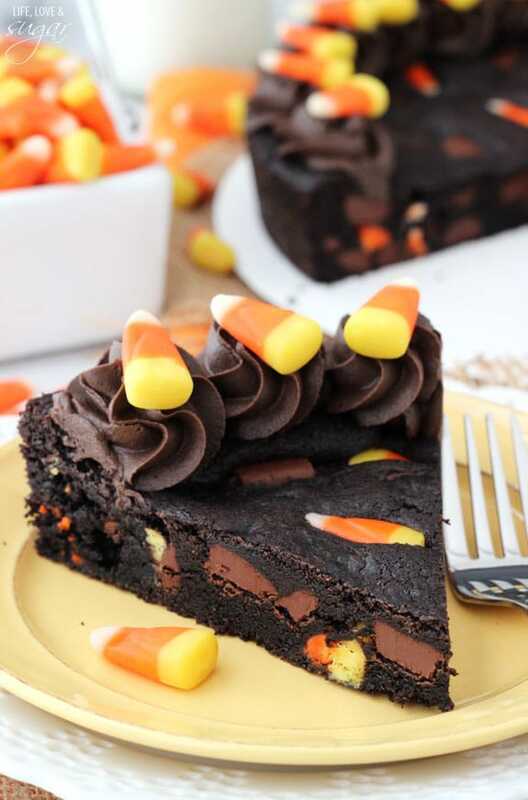 It’s the perfect dessert for fall, and even Halloween since it’s naturally kind of black and orange. I use Hershey’s Special Dark cocoa to get that nice dark chocolate color. Delish! 2. Prepare brownie mix according to directions on the box. 3. Pour batter into springform pan and bake according to directions on box. 4. Allow to cool for about 5 minutes, then remove to cooling rack to finish cooling. 5. Once the brownie has cooled, make the cheesecake. Beat cream cheese and sugar until smooth. 6. Add pumpkin puree and pumpkin pie spice and mix until smooth. 7. Fold in Cool Whip. 8. Place brownie back into the springform pan and line inside edges of pan with parchment paper. 9. 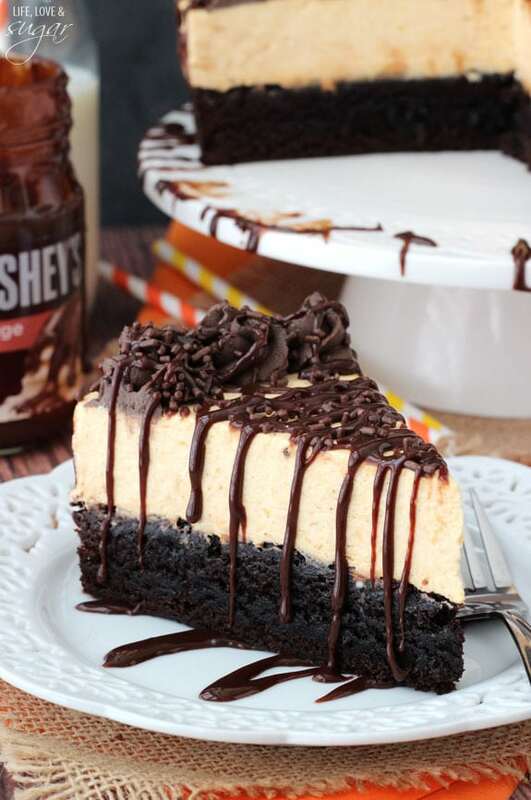 Spread cheesecake evenly on top of brownie, then put in refrigerator until firm about 3-4 hours. 10. To make chocolate whipped cream, freeze a metal bowl and whisk attachment for 10-15 minutes. 12. 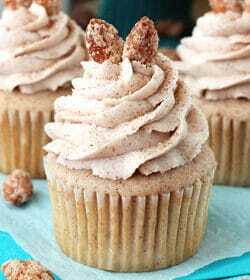 Add powdered sugar and cocoa and whip until it you get stiff peaks. 13. Pipe whipped cream around edges of cheesecake. 14. 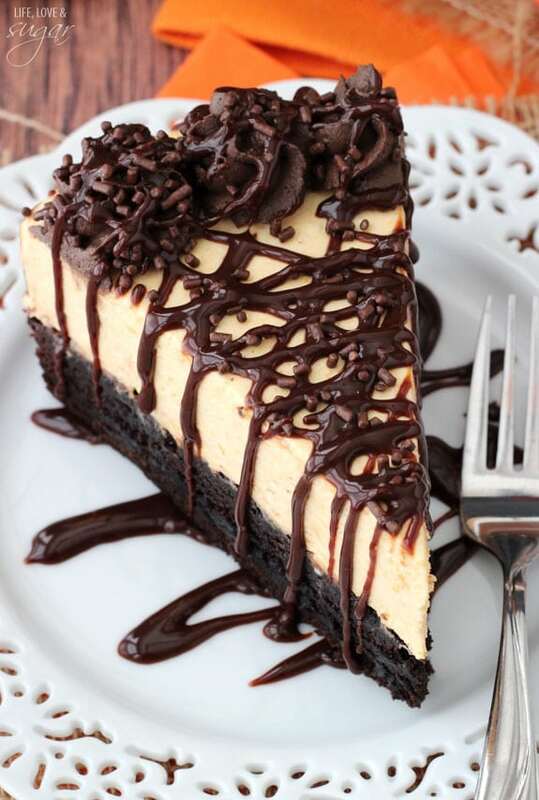 Drizzle chocolate sauce over finished cheesecake, if desired. Definitely! Thanks Lisa! Had a great time meeting you this week! Lindsay, quick your day job ASAP and open a bakery near me!!! 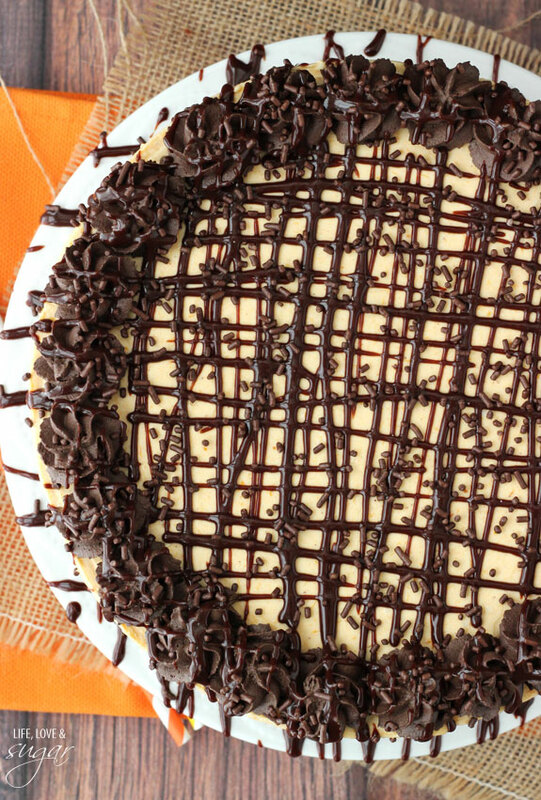 I’m seriously starting to think that pumpkin and chocolate belong together after your recipes. Beautiful! They most definitely do. 🙂 Thanks girl! I hope you’re having fun in Iowa! Wish I was there! That looks downright awesome! Your desserts amaze me! Have a marvelous weekend, Lindsay! I want a ginormous slice of this. It looks so rich and amazing. Pinned! 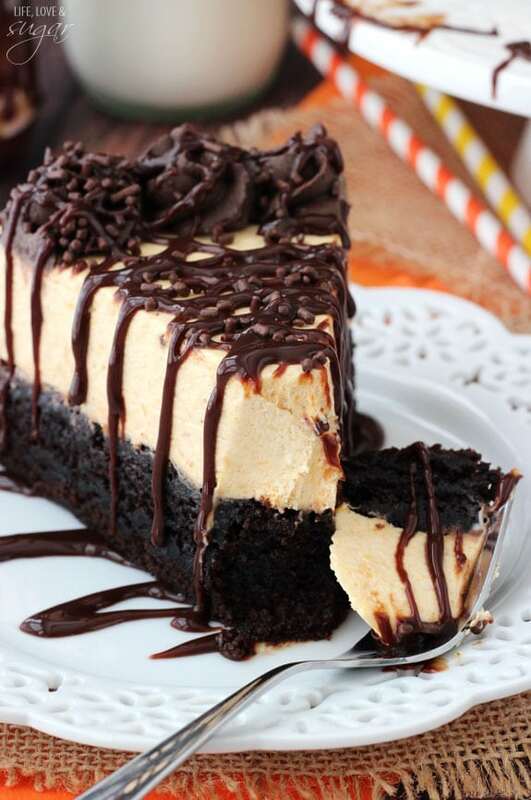 gahhhh, all of my favorite things – chocolate, pumpkin, cheesecake and brownies – love!! I’ve been drooling over this since you showed me earlier this week!! Yum yum yum! You absolutely make the prettiest food! I just want to eat my screen right now! Oh my god I am just drooling here over these images! 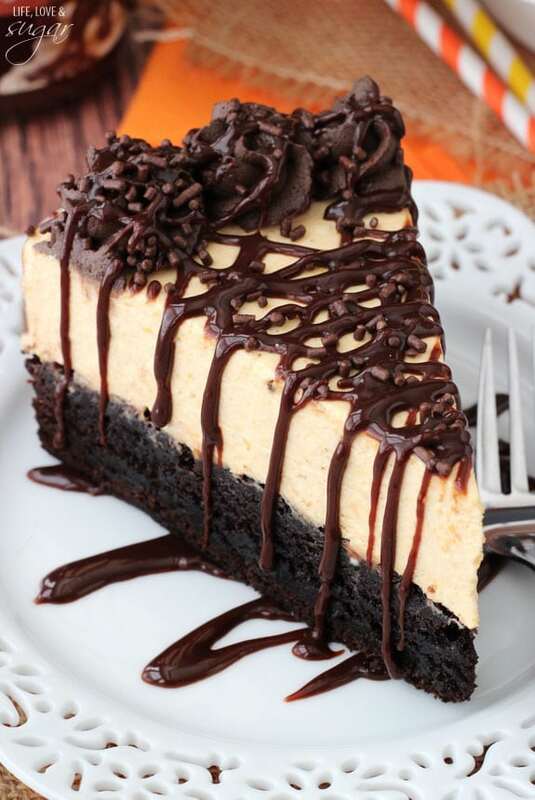 This cheesecake is just perfect.. 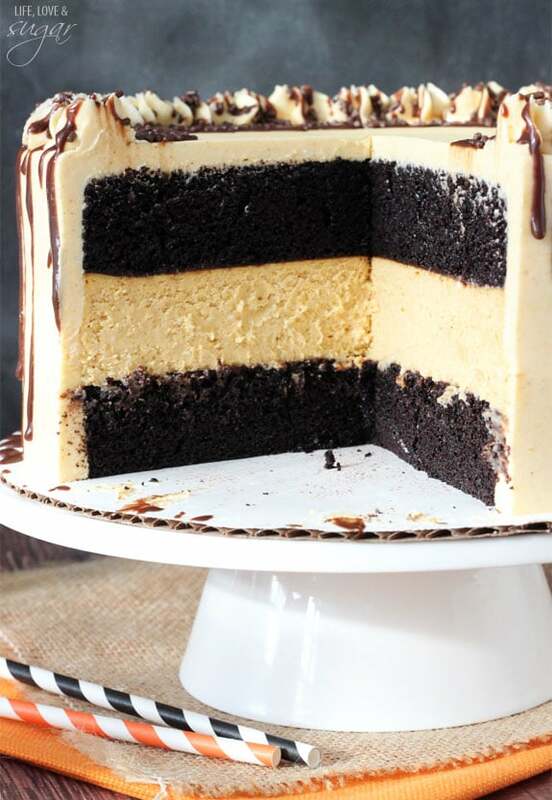 I especially love the contrasting layers and all that chocolate drizzle. 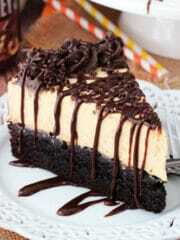 Wish I had a slice right now, Pinned! 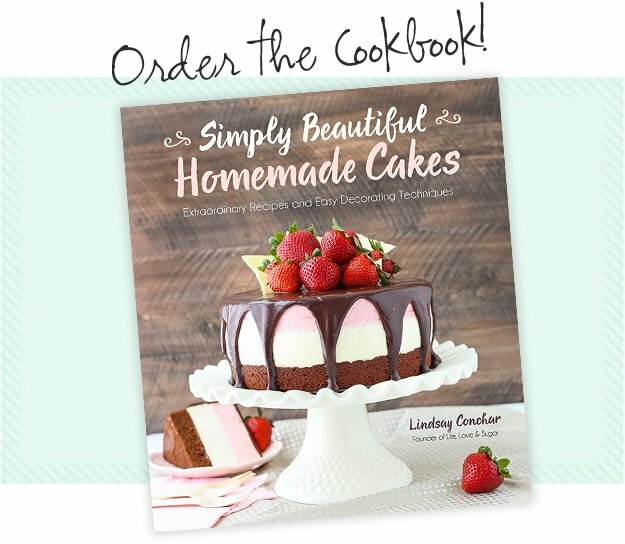 This is a gorgeous cake Lindsay! You made me crave cheesecake at 5:30 in the morning. Impressive! 🙂 Pinned! Aww, that’s so sweet! I’ve gotten so used to flying too that I forget others don’t do it all the time. The peanuts and sodas probably felt like a luxury to him, but I always take those for granted too! But this cheesecake… I totally wouldn’t take it for granted. It looks SO decadent and luxurious. 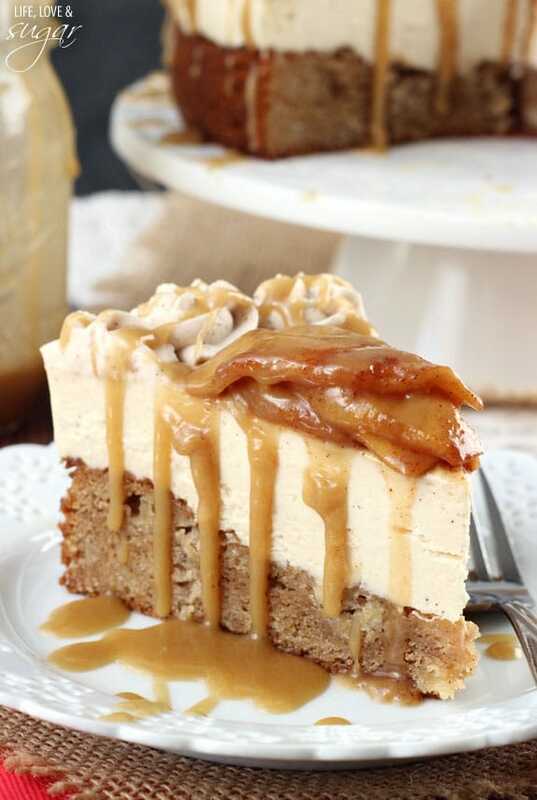 I don’t splurge on too many desserts, but this one… I’d need at least 4 slices. 😉 Pinned! Wow! 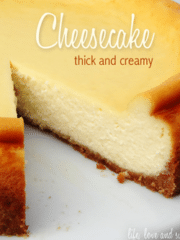 This cheesecake looks amazing and it combines a Fall flavor with a classic flavor. *Applause* is in order. 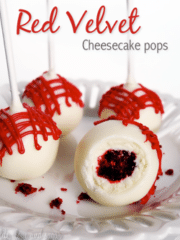 Really…you don’t bake the cheesecake? 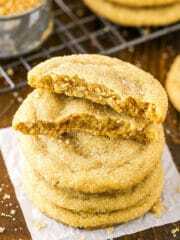 How does it taste, with the unbaked pumpkin and spices??? 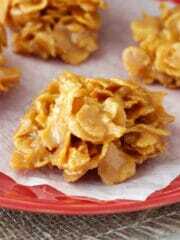 I’d like to make this, but I am a bit scared!! 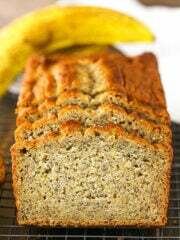 Don’t be afraid – it’s delicious! It really tastes great. If you’d rather use a recipe with a baked cheesecake, you could try this one. 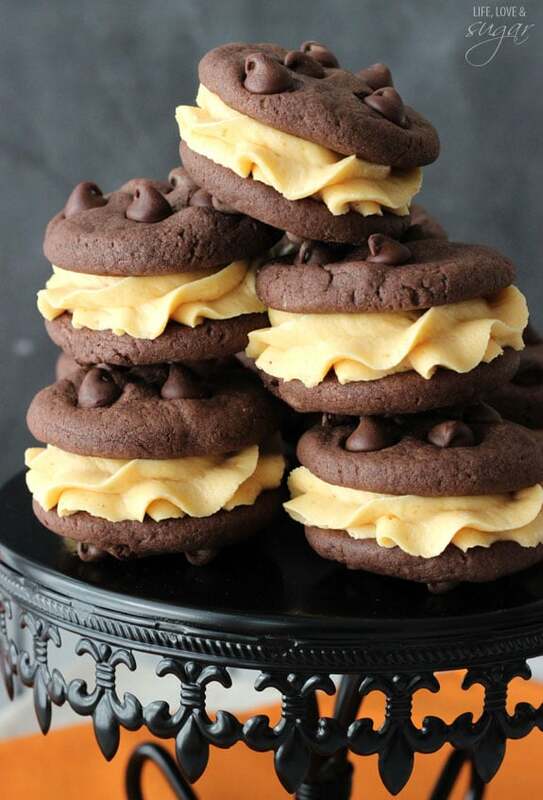 Pumpkin + chocolate are one of my (many) favorite flavor combinations! 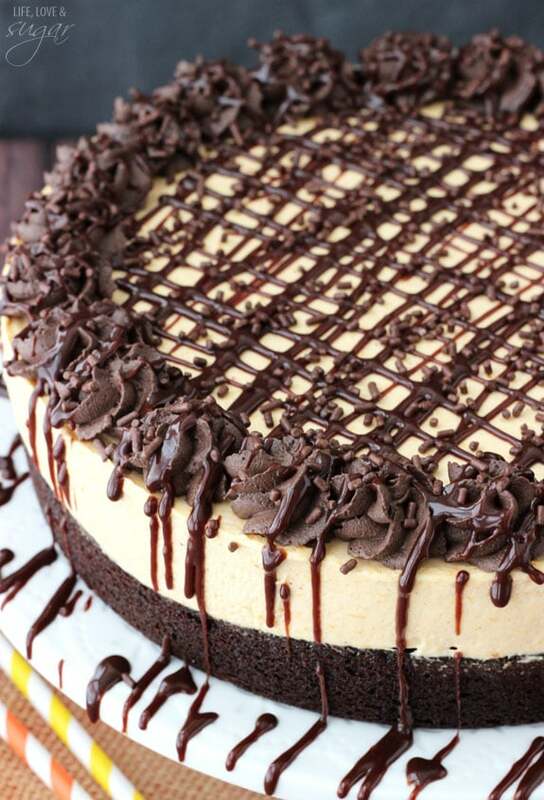 This cheesecake looks to DIE for and you take the most beautiful photos! May I ask what kind of camera and lense you use? 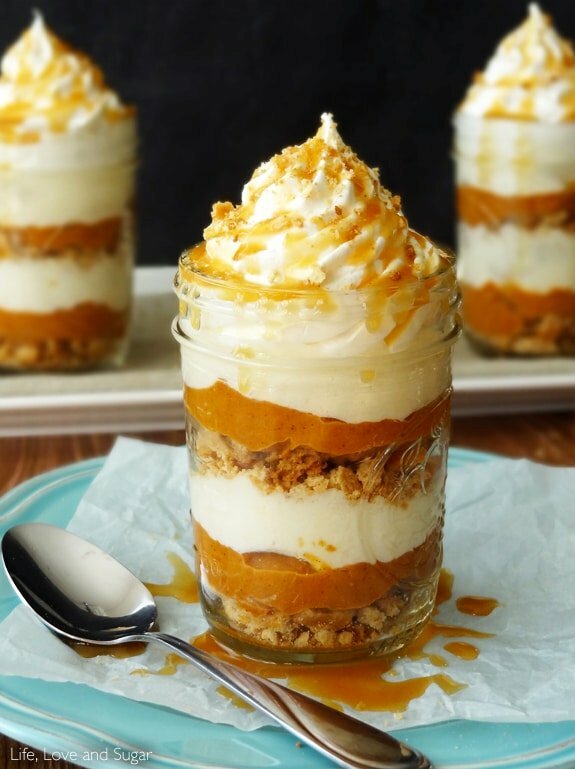 Do you think it would be possible to use real whipped cream instead of cool whip? 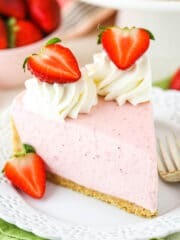 My son can’t have cool whip, but he loves cheesecake and this one looks amazing. Thanks! Yes, real whipped cream should be fine. 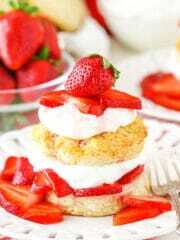 I’d try using about 2/3 cup of whipping cream and 1/4 cup powdered sugar. This was super easy and delicious! Thank you so much, I adore you! How long do you bake the brownie? You should bake the brownie according to the directions on the specific brownie mix you use. Hmm, my usual starting point is somewhere between 15 and 20 minutes. I’d keep an eye on it. I was thinking of making this for Thanksgiving. Will it work if I make it the day before and keep it in the refrigerator? Hihi! You are so amazing! Greeting from Singapore! 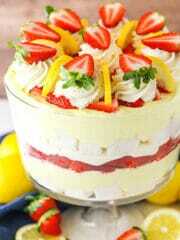 Hehe will like to check if we can’t find cool whip in our country, is there anyway we can substitute width something? Thank so much! Hi Fiona! Thank you! You could replace the Cool Whip with regular whipped cream. It won’t be as firm is a baked cheesecake. It sounds like it’s probably correct – firm, but not super firm. A lot of that is because of the moisture from the pumpkin puree. If you want it to be firmer next time, you could try adding some gelatin. It’d have to be added to warm water to activate it first, then added to the cheesecake. You wouldn’t need much, probably 1 – 1 1/2 tsp of gelatin. This cake is absolutely amazing. I am by no means a master baker, so mine did not look 100% as pretty as this one, but it tasted fantastic! It was not as difficult to make as it looks either. Do you use powdered sugar or granulated sugar in the cheesecake? Thanks so much for your anticipated reply! Hi Maryann! I use regular granulated sugar. Thanks! Made this yesterday and it is absolutely delicious!! Everyone loved it!